Paleontologists find first fossil monkey in North America – but how did it get here? Seven tiny teeth tell the story of an ancient monkey that made a 100-mile ocean crossing between North and South America into modern-day Panama – the first fossil evidence for the existence of monkeys in North America. The find provides the oldest fossil evidence for the interchange of mammals between South and North America and challenges long-held views of South America as an island continent that evolved in isolation before the Isthmus of Panama was formed and animals began crossing between the continents about 3.5 million years ago, said Jonathan Bloch, curator of vertebrate paleontology at the Florida Museum of Natural History on the University of Florida campus. Study findings are detailed online today in the journal Nature. Scientists uncovered the teeth belonging to the 21-million-year-old forest-dwelling primate during recent excavations related to the expansion of the Panama Canal. The new genus and species, dubbed Panamacebus transitus, received its name from the Latin word transit, meaning crossing. It is somewhat of a mystery how P. transitus traveled across the sea dividing North and South America during the early Miocene. It may have swum across, but this would have required covering a distance of more than 100 miles, a difficult feat for even the most talented long-distance swimmers. It’s more likely P. transitus unintentionally rafted across on mats of vegetation, much like their ancestors who probably made their way from Africa to the New World in a similar fashion, Bloch said. The unearthing of P. transitus – which probably looked a lot like a capuchin or “organ grinder” monkey – adds a new chapter to the “utterly bizarre” history of New World monkeys, Bloch said. The ocean-faring monkey suggests the modern diversification of New World monkeys happened in the ancient tropics. 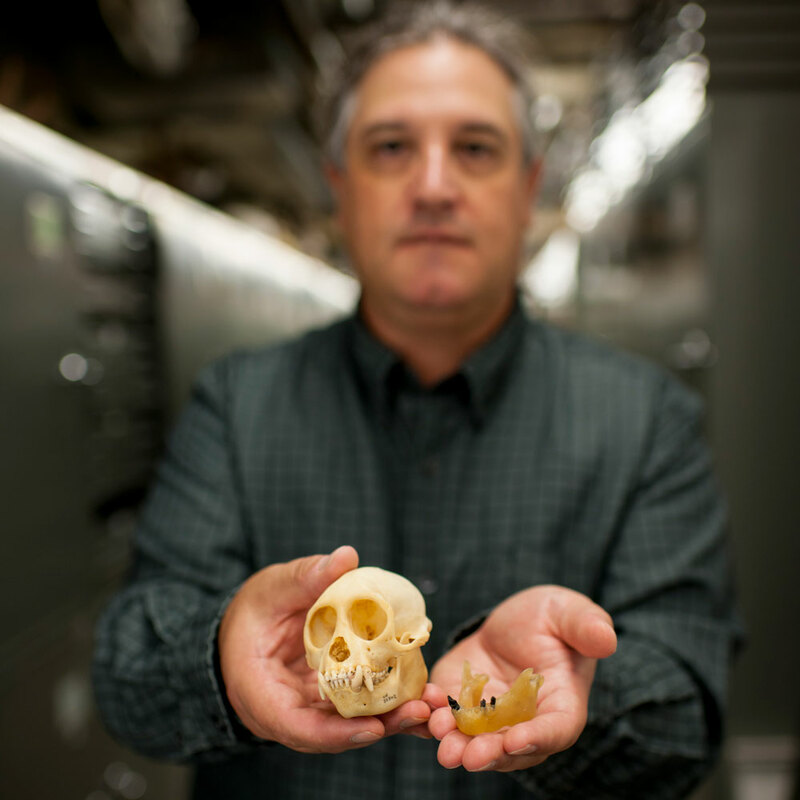 The surprising discovery of the first fossil monkey from North America extends the record for the beginning of the modern diversification of New World monkeys by more than 5 million years, Bloch said. It also provides fossil evidence for a pattern previously documented by molecular scientists who have suggested for some time that a variety of animals, including amphibians, reptiles, freshwater fishes and insects made ocean crossings between North and South America during the early Miocene. New World monkeys today are restricted to tropical forests from Brazil to southern Mexico, but during the early Miocene they were found throughout South America, including some of the continent’s highest latitudes. The new primate raises the question of why these monkeys are not found farther north once they crossed the seaway into Panama, said study co-author Aaron Wood, who discovered the first teeth belonging to P. transitus as a Florida Museum postdoctoral researcher in 2012. Bloch said maybe acorns in the northern forests just weren’t particularly tasty to a South American monkey used to eating tropical fruit. But the same dense jungles that provide monkeys with the fruits and habitats they enjoy today also make it difficult to find fossils in the tropics, Bloch said. Study co-authors include Douglas Jones, Nathan Jud, Bruce MacFadden, Aldo Rincon and Emily Woodruff with the Florida Museum; David Foster with UF’s Department Geological Sciences; Arianna Harrington, Duke University; Carlos Jaramillo, Smithsonian Tropical Research Institute in Panama; Camilo Montes, Universidad de los Andes in Colombia; Gary Morgan, the New Mexico Museum of Natural History and Science; Aaron R. Wood, Iowa State University, Ames.